The Battle of the Atlantic was the longest continuous military campaign in World War Two, running from 1939 to the defeat of Germany in 1945. The purpose of this battle was to block all shipping (logistics) running in and out of each other's country. Although this is called the Battle of the Atlantic, it was also fought in the North Sea, Irish Sea, Labrador Sea, Gulf of St Lawrence, Caribbean Sea, Gulf of Mexico, Outer Banks, and in the Arctic Ocean. The objective for the Germans was to block all shipping going into England and Russia. Hitler knew that Britain was heavily dependent upon imported goods, as this little island nation could not sustain itself. England barely grew enough food to feed one-third of their population. For the most part, Hitler relied on his fleet of U-boat submarines to do the job. But he did use other ships and the Luftwaffe to sink shipping. But if he had been half as smart as he thought he was, he would've known his navy was too small. Nor did he understand just how really important it was to have a strong navy. By the time WWII broke out, Britain's Royal Navy was the largest and most experienced navy in the world. They had literally ruled the seas for over three and a half centuries. Nor were they alone, as their Commonwealth nations pitched in. They also got additional help with ships that had managed to escape from France, Belgium, Netherlands, Norway and Poland. Of course later, when the US entered the war, Hitler's navy was really out-numbered. Hitler relied on hit and run terror tactics to discourage Allied shipping by sinking as many merchant ships as he could. He should've known better because this tactic didn't work when they used during the first world war. Make no mistake, Germany did sink a lot of ships and killed thousands of sailors which did create a lot of terror, but with little success in actually stopping or slowing down the logistic supplies running into Britain. Another big factor was the size of the Merchant Marines. The US mass-produced 2,710 Liberty ships and added them to the already huge Allied merchant fleet. There were just too many merchant ships for the Germans to sink. At first the German navy found their job fairly easy. There were too many blind spots in the Atlantic that were beyond the reach of Allied land-based planes. But soon more bases were created, such as in Greenland and Iceland, and the new US B-24 bombers had the range to close all the gaps. 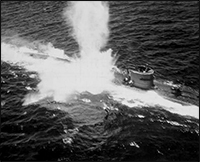 The Allies also developed other technologies, like radar and sonar, to hunt down these pesky U-boats. On top of that, the British broke the German's unbreakable Enigma code which allowed them to intercept all of their radio communications. The chances for anyone serving on a U-boat to survive the war became extremely slim. There are many lessons to be learned from the Battle of the Atlantic. Everyone should understand the importance of a strong navy and how vitally important it is logistically. A battle for any sea is a battle for controlling logistics, without which the combat soldiers don't have much of a chance. Winning the Battle of the Atlantic not only kept Britain supplied, but allowed the Allies to invade occupied Europe. D-Day never would have happened if the Allies hadn't first gained control of the skies and the seas. Even the United States didn't fully appreciate this until this war. After their hard-learned experiences in the Atlantic and Pacific, they emerged from this war as the new rulers of the seas.